I started using it yesterday morning during our Bible time. I had Connor read the two page story from the Sermon on the Mount and he did it!!! Yeah! And he remembered the story much better than me reading it to him. So far, looking through it, I'm very impressed with the way Karen Henley wrote it. I think it captures the heart of the passage of scripture without leaving out important things. You can go here to read an excerpt. Anyone else have a Bible learn-to-read source? 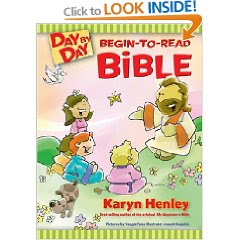 I also recommend the Day to Day Kid's Bible for a to parent read-aloud to young children for discussion or for older early readers to read themselves. The Good and Evil book for engaging more realistic images of Bible stories and discussion. Thank you! We have one my husband got at Wal-Mart. Of course Daniel isn't anywhere near reading yet! ha! I have the same thing with my 3 year old and 5 year old boys going on! It is amazing how many more resources are available now, then when I started homeschooling on the mission field (Honduras) over twenty years ago.